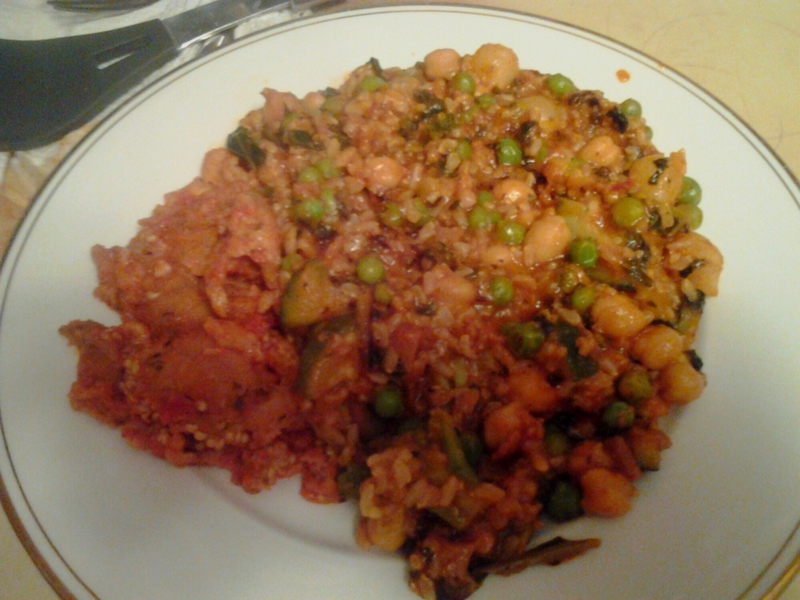 It just occurred to me that I haven’t blogged about my new vegan lifestyle for a couple of months. I don’t want anyone to think I’ve fallen off the wagon and am afraid to admit it. I haven’t touched a single slice of meat since I gave it up in June. I’m continually surprised by how easy it has been. I always used to say I could never give up my bacon. I used to be a demon for eating meat. I especially loved bacon cheeseburgers. I cringe now to realize that for me to eat that, two animals had to be killed. A cow and a pig. I feel so sad to think how many of those I’ve eaten in my life. Oh if only I could turn back the clock and change my eating habits earlier. But I can’t. All I can do is keep up my new lifestyle. I’m looking forward to showing the family that I am vegan for life. So far they have been mainly supportive. Although the mother in law keeps suggesting I could eat meat once in a while. I guess some people just don’t understand. I’m looking forward to Thanksgiving this year. I enjoy the occasions when the family gather together. I never had that growing up. My family was scattered far and wide. So in case I don’t blog before, though I probably will, Happy Thanksgiving for next week to all who celebrate it. Thirteen weeks ago I made the decision to become vegetarian. I don’t know where it came from, but I’m so glad I made the choice. My wife has been a vegetarian for twenty years. When we first got together, I remember saying to her, “don’t try to convert me.” I loved to eat meat and I couldn’t imagine giving up my bacon and burgers. Yes, I was an avid meat eater. I think she always held out hope that one day I would change my mind. It took nine years, but I’m finally there! And all it took was a stray thought as I was half way through a bacon cheese burger. That was it. The burger that I had been enjoying suddenly tasted like death. The next day I made the transition. Needless to say my wife was delighted when I told her! I don’t really know where the thought came from. I hadn’t read anything, seen anything online or on the television relating to animals and my wife hadn’t said anything for a while. Maybe I was just ready. Obviously I’ve always known where meat comes from. But like so many people I preferred to just bury my head in the sand and not think about how that meat came to be on my plate. Until one day I couldn’t ignore it any more. My conscience wouldn’t let me. I’ve always considered myself to be an animal lover, but how could I call myself that when I ate animals almost daily? I could hardly say “well, I love some animals, but I love to eat others.” So I finally came to my senses and gave up meat. I’m amazed at how easy it has been. I haven’t really had any crisis, no cravings for any meat. And some of the meals we’ve had in the past three months or so have been delicious. I’m sure there are people out there who imagine a vegetarian’s plate to consist of vegetables, potatoes and a gaping hole where a piece of meat used to be. 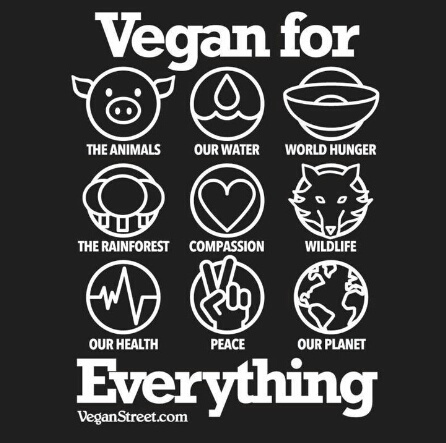 But there are so many things out there vegans can eat. And thanks to the internet, with a little research you can easily make a pain free decision to become vegan. And it really will be pain free because no animals will have been harmed for you to enjoy your meal. And contrary to popular opinion you can easily get enough protein from vegetables, grains and nuts. A week after turning vegetarian, after researching the dairy industry we agreed to take it to the max and go vegan. I decided after becoming vegan that I wouldn’t be an activist. I decided I wouldn’t go round bashing others for doing what I, myself, was doing just a few weeks ago. But I can’t help wishing more people would consider giving a vegan diet a go. Even if you don’t think you could hack such a radical change forever, just cutting down on your meat consumption would make a huge difference. Every little helps. And if you get a lot of people doing a little, that would make a huge difference for the animals. An ever growing population is placing ever greater demand for meat. That means more animals are being bred to be slaughtered to keep up with that demand. And let’s face it, corporate companies are not interested in the comfort and welfare of the animals in captivity, waiting for their turn on the chopping block. Cold hard cash is the only concern of the meat industry. With the demand for meat on the rise, these companies are cutting corners on the welfare of the animals held in captivity, adding to the misery of their lives before the inevitable and horrific end. So we’re enjoying our vegan lifestyle, experimenting with new dishes and I for one am enjoying new flavors I never would have experienced if I’d remained a meat and potatoes guy. I created this blog and my Twitter account mainly to promote our home based business. But my blog seems to have morphed into something bigger. I have written several blogs about the GC Control shakes that I still drink daily. They are still doing a great job in lowering my blood sugar level when it’s high. I’ve been drinking them for a year and a half now. Note, I am not touting the shakes as some sort of miracle cure. I know diabetics are often targeted by snake oil salesmen offering some form of miracle cure. But the GC Control shakes are an excellent tool to help you control your blood sugar levels. Recently I became a vegetarian. I then quickly moved on to become a vegan. My reasons are mainly ethical: As an animal lover I could no longer just I ft to myself eating meat. I’ve already written blogs that go into this. But I have noticed that there are plenty of health reasons for making the switch. I’ve already lost a few pounds and I find I have more energy. More people these days are looking at their diet and realizing there is a connection between what they eat and how they feel. The vegan lifestyle is becoming more popular, as evidenced by the growing number of vegan foods that are becoming available in mainstream grocery stores. I was amazed the other night at the array of vegan options in our local Stop and Shop. Vegan cheese, butter, mayonnaise and even ice cream! Gyms have always been popular. People want to get in shape. Obesity has become an epidemic. Diseases like diabetes are consquently on the rise. There is a definite need to take care of our health. We need to take back our Wellness! Diet and exercise are part of two paths to Wellness. Personal and physical. But so many people overlook the third path; environmental. This can have more of a detrimental impact on our health than we realize. We don’t pay enough attention to the cleaning products we bring into our homes and use daily. Products that contain so many harmful chemicals and toxins. We have a real toxic stew in our homes and we don’t even realize it! Respiratory illnesses, like asthma, and skin conditions, like eczema, are on the rise. Most of them are triggered by the chemicals in the store bought cleaning products. We’re conditioned to go on buying them. Mainly because everyone else does and because we don’t know any better. 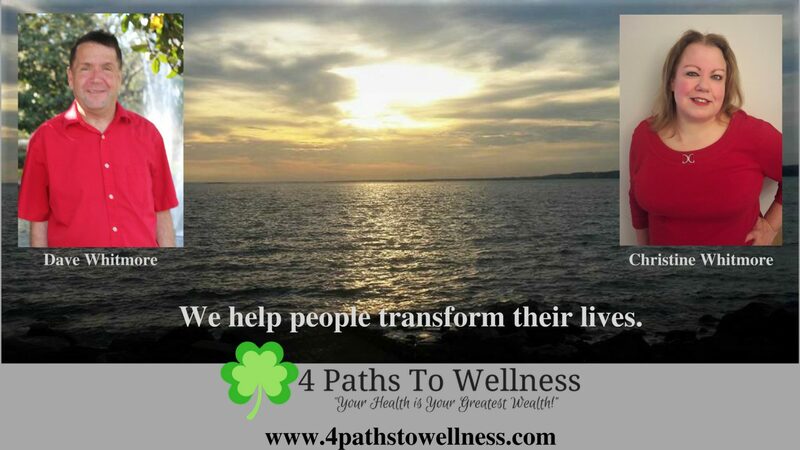 While most people are thinking more about two paths to Wellness, personal and physical, we offer a way to align all four paths and help you to create a life in balance. I became a vegetarian just under two weeks ago. I didn’t rush into it. It wasn’t a spur of the moment decision. It had been coming for a while. My conscience had been pricking me. How can I call myself an animal lover when I eat meat? I’m sure it’s something many people who call themselves animal lovers wrestle with. The final kicker came as I was tucking into a burger one night and the stray thought flashed into my mind, “I’m eating a dead cow.” The burger didn’t taste so good after that, I can tell you. Two days later, I made the change. I figured I could still eat dairy. That way I could always select an omelette if we were at a diner that didn’t offer good vegetarian food. The dairy industry doesn’t harm animals as much as the meat industry, right? I discovered the truth when I saw several videos on YouTube. That changed everything. Now being a vegetarian wasn’t enough. The videos showed what really goes on in the meat and dairy industries. How the cows are milked three times a day. Far too many times. Enough times to cause infections. Enough times to cause the animals great distress. And when the cow is too old to provide milk, when its been worn out, what is its reward? Does it get to spend the rest of its life grazing in a pasture? Does it get retirement? Nope. Off it goes to the slaughter house. The dairy industry has to screw every dollar it can get from its victims. And the cows are repeatedly impregnated. When the calf is born, it’s taken from its mother. Can’t have the calf drinking the profits now, can we? I’ve heard that cows bellow for days grieving for their young. And you thought animals don’t have feelings. By the way, that calf? If it’s male it goes to the slaughter house to become veal. If it’s female it gets subjected to the same treatment its mother got. These videos opened my eyes to the truth about the dairy industry. They also showed what really goes on in a slaughter house. I saw images I wish I could unsee! But they did their job. I would share links. But most meat eaters probably won’t watch them. As an experiment I posted a video on facebook about the slaughter of pigs. I got one comment from a woman who said “I can’t watch this video. I’m sure it’s heartbreaking. Meat eating is something I can do only without thinking about how it gets to the plate.” Thus neatly missing the whole point of my posting the video. Sadly all too many meat eaters are like that. Ignorance is bliss? Not for all those animals who suffer daily for your meat habit. I bet if we all had to go out and kill animals for food there’d be a sudden rush of vegetarians overnight. People want their meat. But only as long as someone else is willing to do the dirty work. As long as someone else gets blood on their hands everything is just fine and dandy. When I first became vegetarian I swore to myself it was only my decision. I wouldn’t preach. I wouldn’t try to convert anyone. But the more you know about the meat and dairy industries the harder it becomes to stay silent. People just don’t realize just how inhuman it all is. The overwhelming suffering so many animals have to go through every single day. The fear. The pain. .
Just so you can enjoy your burger. Or your bacon and egg sandwich..
Now, it’s easy to dismiss a video. It’s easy to say this was an extreme example. That this is the exception, not the rule. Are you really that naive? I think people have this image of all food animals living out this wonderful Disney style life where they have lots of room to roam in, all the grass they could want to eat until the day their time comes and they’re led to one side to be killed humanely. Question. How exactly do you kill an animal humanely. If your cat or your dog is really sick, you can take it to a vet and if it’s beyond help you can end its suffering painlessly with a simple injection and it just goes peacefully to sleep and then dies. A cow or a pig gets hung upside down and gets cut open. While it’s still very much conscious and squirming and screaming in pain. I’m sorry, was that too graphic for you? If what goes on in a slaughterhouse was portrayed in a horror movie there would be an outcry. It’s too graphic. It’s too sadistic. It’s horrifying. So how come it’s acceptable that something so horrifying goes on day after day? All over the world. There’s a reason it’s called a slaughterhouse. Think about it. 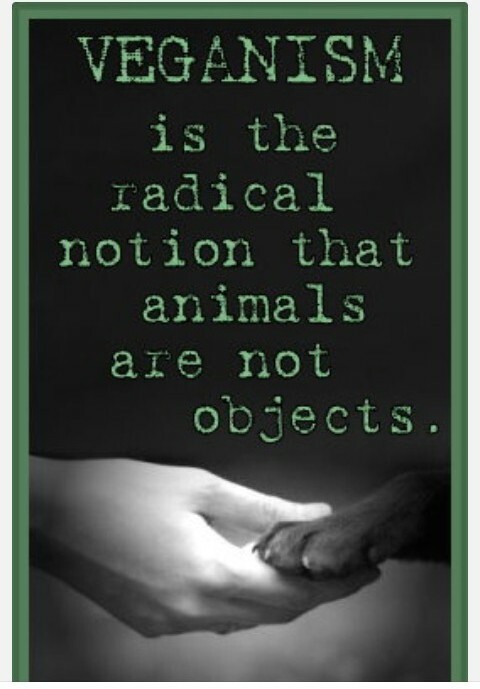 There is nothing gentle or humane about it. I’ve only just become a vegan. So I haven’t had many reactions yet. But vegans online say a lot of people ask them, “Where do you get your protein?” Well, there is plenty of protein in vegetables and fruits. Also in grains, beans, nuts etc. More than enough. In fact, most meat eaters get far more protein than is healthy for them pretty much every day. Plus cholesterol and saturated fat. Neither of those exist in the natural world. Studies have actually shown animal protein is the worst form of protein for the human body. Not to mention the obesity rate is rapidly rising. People are getting sicker and it’s mainly from their diet. Since becoming a vegan I feel I have more energy. I’ve already lost three pounds and I’ve only been vegan a few days. And a new study suggests that a vegan diet can actually reverse diabetes. So plenty of reasons to go vegan. Not so many reasons to eat meat. Even if you could care less about the welfare of the animals, maybe you care more about your health? How’s your cholesterol? Antibiotics injected into animals to make them grow bigger. Pink goo put in your meat to make it look more appetizing. Frequent meat recalls due to salmonella and other hazards. I’m glad I don’t have to worry about any of that any more! Some meat eaters argue that we’re top of the food chain, or we have carnivorous teeth designed to eat meat. As far as being top of the food chain goes, showing compassion to the animal world isn’t high on their list of priorities, clearly. And, no, we don’t have carnivorous teeth. Are you referring to those fangs lions and tigers etc have, designed to rip and tear flesh? Our teeth are more designed to crunch and chew. Also, true carnivores have a short intestinal tract, so meat can be absorbed and jettisoned more rapidly. Why? Well, meat rots quickly. Herbivores have long intestinal tracts, designed to slowly digest and absorb nutrients from vegetables and plants. We have long intestinal tracts, just like the herbivores. Guess what that means? You have meat rotting in your gut because it doesn’t get jettisoned quickly enough. There is only one true reason people eat meat. Because it tastes good. I know. Remember, I’ve only been vegetarian for less than two weeks. I remember how good burgers and bacon tasted. I will never eat them again, though. Do you think we’re born to eat meat? Do we have some kind of instinct to eat meat? When a child is first introduced to a small animal what does it do? Does it want to pet the animal? Does it want to play with the animal? Or does it try to eat the animal? Hopefully you said no to the last option! If not, call a psychiatrist! No, it isn’t our instinct to eat flesh. We learn to from society. From our parents. From everyone around us who eats meat. Maybe it’s time for a change. You might not have a choice for much longer. With the world population growing, the demand for meat is starting to grow faster than the ability to supply. The amount of grain and water required to feed animals prior to their slaughter is extravagant. Many starving people in the world would have food to eat if that food wasn’t required to feed the animals. More and more forestation is being destroyed to create more land to feed more animals to keep up with the demand. Even if people cut down their meat consumption to three or four days a week, it would make a huge difference. I know a simple blog won’t change the minds of simple die-hard meat eaters. The kind who bluster “I don’t care. Meat good. I eat meat.” But if you’re reading this, and if you’ve been thinking of at least cutting back on eating meat, or even giving vegetarianism a try, then let me assure you it’s very easy to live and eat healthy without meat. The fact you are reading this shows you are on the internet. Google living as a vegetarian. Google living as a vegan. There are so many sites out there with so much information. Plus there are groups that can support and advise you on making an easy transition to a kinder, more humane way of living. Some people argue one person can’t make a difference. And it’s true. But if one person reached out to one person who reached out to one person…. Be that one person. Start making a difference. Start today. The animal kingdom will thank you for it. We had eggplant stir fry. The eggplant was a bit of a cheat really. It was something that had already been prepared. In place of oil (as we’re trying to keep that to an absolute minimum) we used a can of tomato and basil soup as the base. We added kale, broccoli, pearl onions, peas, zucchini, chick peas, we added some crumbled veggie burger and some seasonings. We also added organic brown rice from Trader Joe’s. Altogether, the meal came together perfectly. We have a new go to meal. The whole thing took about half an hour to prep and cook. Next time I’d love to add mushrooms as I love their flavor. The meat eaters can keep their burgers, bacon and hot dogs. They don’t even begin to compare to meals like this! I had my first big test last night on my resolve to be vegetarian. My wife and I went to a block party in Brooklyn. There were chicken and sausages. But there was plenty of vegetarian fare too. My wife has been a vegetarian for over twenty years so the people hosting the party knew to make sure there was plenty of meat free fare to enjoy. Most of the family didn’t know I’d just become a veggie so they must have been surprised! So when I went to get my food I looked at the meat and wasn’t even tempted. In fact I was a little revolted at the idea of eating it. There was plenty of pasta, eggplant, broccoli etc. I only needed a plateful. It seems when you don’t eat meat you get satisfied more easily. I’m also enjoying not having to put up with that uncomfortable bloated feeling that often comes with eating meat. Especially red meat. I feel more secure and confident in my new vegetarian lifestyle. Confident that I can maintain this. Confident that I will never eat meat again. It’s now over a week since I decided to give up meat. I don’t miss it at all. I haven’t had any craving at all for any of the meat I used to consume. I don’t even miss bacon and I thought I’d miss that most of all. I’ve also given up dairy milk. I discovered coconut milk. It actually tastes better than dairy milk. I’m looking forward to my first trip to Trader Joe’s as a vegetarian. I’m going to try vegan cheese and butter. I’m not sure I’m going to go 100% vegan but I’ll go as close as I can. I feel better now I’m not eating meat. I feel better emotionally. My conscience is clear knowing no animals have to die for me to eat. I’ve always been an animal lover. I no longer felt I could say that and yet continue to eat animal flesh. I also feel better physically. I have more energy. People often think you need to eat meat to get enough protein. But, in fact, animal protein is actually the worst protein you can have. Plants have protein. Nuts and beans have protein. I also eat a greater variety of food since I gave up meat. I’m looking forward to experimenting with new dishes. I’ll be sharing more blogs on my new healthier lifestyle. It’s now five days since I stopped eating meat. I made my decision Friday night. Ironically after eating a chicken tikka dinner. At least my last meat dish was a good one. I fully expected to miss meat. Maybe even to crave meat. After all, I’ve always been fond of a good burger. Or a bacon and egg sandwich. But so far, nothing. Even typing this out didn’t even give me a twinge of regret. I guess my mind and body are really in sync on this! Originally I had intended simply giving up meat. Then I thought ‘I can give up eating cows and pigs, but maybe if I’m at a restaurant that has limited veggie options I can eat chicken. Them the thought of eating chicken turned my stomach. And I knew I would never eat meat again. What I didn’t expect was the thought of going vegan. It simply seemed too much hassle. But as I started following people who are vegetarian on Twitter and Google +. I started seeing all the stuff about dairy farming. And I wanted no part of that either. So last night we went to our local Stop and Shop and I bought a carton of So Delicious coconut milk. I tried it on my cereal this morning and I really liked it! So now I’ve given up cows milk too. We have a Trader Joe’s store not far away. They have a huge variety of vegetarian and, I believe, vegan food. Maybe I’ll get to try some vegan cheese and butter. After all, if I’m going to do this, I might as well do it right! Not bad for a man who once told his wife she will never get him to go veggie. She’s been a vegetarian for over twenty years. I’d made sure she wouldn’t try to get me to change my diet. I loved my burgers. And bacon. And shrimp. And even while typing this I still don’t feel the slightest urge to go back. Last night we did our first shop as joint vegetarians. It was fun and really eye-opening to see all the non-meat food options available in a regular store. And meat eaters think all we eat is vegetables! I have my first big test coming this Saturday. We’re going to a block party. We went last year. There will be plenty of meat dishes to try to tempt me. It’s/mainly Italian food so there will be veggie dishes too. Pasta. Eggplant. But will those meatballs and sausage and chicken dishes try to tempt back to the Dark Side? I’ll tell you all about it in a blog on Sunday. Until then, happy good eating fellow vegetarians and vegans! So it’s day three since I decided to become a vegetarian. This might be the longest I’ve ever gone without meat. Even when I was sick I would often have chicken soup. We went out to eat last night, my first restaurant meal since I cut out meat. I tried eggplant rollatini for the first time and I loved it! If I’m going to eat like this all the time as a veggie, I won’t even miss meat! My wife’s favourite food is eggplant parmagiana. She has been a vegetarian for over 20 years. I guess we can share when we eat out or taste each other’s meals! I’ve been reading up on the benefits of various vegetable dishes. I’m a diabetic and I’ve been reading about how coconut, oats and soy all help regulate blood sugar levels. So that’s another big reason to stay the course. I’ve never read about any piece of meat having that sort of benefit. So far I’ve had no cravings for any meat (although I know it’s only been three days and the real test is to come when I’m eating food with other people who are eating meat). If I do feel any craving then I’ll just remind myself why I made the choice to become vegetarian. I don’t see any major problem, though. I simply don’t like the idea of eating meat anymore. I’ve always been an animal lover and I just can’t live with the idea of an animal having to die so I can eat. The simple truth is we don’t need to eat meat. It’s not essential to our diet. With the choices available to us today we can get all the nutrients we need from eating a vegetarian diet. Most people eat meat simply because they’re conditioned to, because everyone else does and because it tastes good. Those reasons are no longer enough to justify to myself any reason to continue eating a creature that had to be killed so I could eat it. My change came when I was eating a burger several days ago and the thought came into my mind that I’m eating a dead cow. Suddenly that burger didn’t taste so good anymore.